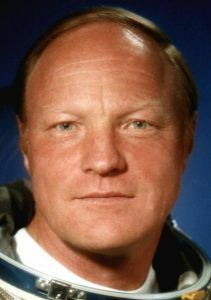 Ukrainian test pilot cosmonaut 1977-1996. Status: Deceased; Active 1977-1996. Born: 1937-04-12. Died: 2017-01-03. Spaceflights: 1 . Total time in space: 11.80 days. Birth Place: Zmiev, Kharkov. Graduated from Military Pilot School, Kirovograd, 1956 and from Moscow Aviation Institute with an engineering degree, 1969 Colonel, Russia Air Force, and civilian test pilot of LII. Cosmonaut training December 1978 - July 1980. Buran Test Pilot, Head of Buran test pilot corps. Commander, Gromov Flight Research Center at Gromov Flight Research Institute (LII). After 40 years of working for the LII he retired in February 2002. Family: Cosmonaut. Country: Ukraine. Spacecraft: Salyut 7. Flights: Soyuz T-12, Buran 5. Agency: VVS. Bibliography: 4452, 6158. 1937 April 12 - . Birth of Igor Petrovich Volk - . Nation: Ukraine. Related Persons: Volk. Ukrainian test pilot cosmonaut 1977-1996. 1 spaceflight, 11.8 days in space. Flew to orbit on Soyuz T-12 (1984)..
1984 December 29 - . Launch Site: Baikonur. Launch Complex: Baikonur Jubilee. Buran Analog BST-02 taxi test 1 - . Crew: Stankevicius, Volk. Nation: Russia. Related Persons: Stankevicius, Volk. Program: Buran. Class: Manned. Type: Manned spaceplane. Spacecraft Bus: Buran. Spacecraft: Buran Analogue. Maximum speed 45 kph. Time 5 minutes. Thereafter to PRSO test stand for full-scale equipment tests; then to PDST pilot-dynamics test stand for further tests..
1985 August 2 - . Launch Site: Baikonur. Launch Complex: Baikonur Jubilee. Buran Analog BST-02 taxi test 2 - . Crew: Stankevicius, Volk. Nation: Russia. Related Persons: Stankevicius, Volk. Program: Buran. Class: Manned. Type: Manned spaceplane. Spacecraft Bus: Buran. Spacecraft: Buran Analogue. Maximum speed 200 kph. Time 14 minutes..
1985 October 5 - . Launch Site: Baikonur. Launch Complex: Baikonur Jubilee. Buran Analog BST-02 taxi test 3 - . Crew: Stankevicius, Volk. Nation: Russia. Related Persons: Stankevicius, Volk. Program: Buran. Class: Manned. Type: Manned spaceplane. Spacecraft Bus: Buran. Spacecraft: Buran Analogue. Maximum speed 270 kph. Time 12 minutes..
1985 October 15 - . Launch Site: Baikonur. Launch Complex: Baikonur Jubilee. Buran Analog BST-02 taxi test 4 - . Crew: Stankevicius, Volk. Nation: Russia. Related Persons: Stankevicius, Volk. Program: Buran. Class: Manned. Type: Manned spaceplane. Spacecraft Bus: Buran. Spacecraft: Buran Analogue. Maximum speed 300 kph..
1985 November 10 - . Launch Site: Baikonur. Launch Complex: Baikonur Jubilee. Buran Analog BST-02 flight 1 - . Crew: Stankevicius, Volk. Nation: Russia. Related Persons: Stankevicius, Volk. Program: Buran. Class: Manned. Type: Manned spaceplane. Spacecraft Bus: Buran. Spacecraft: Buran Analogue. Maximum speed 480 kph. Maximum altitude 1500 m. Time 12 minutes..
1985 November 15 - . Launch Site: Baikonur. Launch Complex: Baikonur Jubilee. Buran Analog BST-02 taxi test 5 - . Crew: Stankevicius, Volk. Nation: Russia. Related Persons: Stankevicius, Volk. Program: Buran. Class: Manned. Type: Manned spaceplane. Spacecraft Bus: Buran. Spacecraft: Buran Analogue. Maximum speed 170 kph. Time 12 minutes..
1986 January 3 - . Launch Site: Baikonur. Launch Complex: Baikonur Jubilee. Buran Analog BST-02 flight 2 - . Crew: Stankevicius, Volk. Nation: Russia. Related Persons: Stankevicius, Volk. Program: Buran. Class: Manned. Type: Manned spaceplane. Spacecraft Bus: Buran. Spacecraft: Buran Analogue. Maximum speed 520 kph. Maximum altitude 3000 m. Time 36 minutes..
1986 May 27 - . Launch Site: Baikonur. Launch Complex: Baikonur Jubilee. Buran Analog BST-02 flight 3 - . Crew: Stankevicius, Volk. Nation: Russia. Related Persons: Stankevicius, Volk. Program: Buran. Class: Manned. Type: Manned spaceplane. Spacecraft Bus: Buran. Spacecraft: Buran Analogue. Maximum speed 540 kph. Maximum altitude 4000 m. Time 23 minutes..
1986 June 11 - . Launch Site: Baikonur. Launch Complex: Baikonur Jubilee. Buran Analog BST-02 flight 4 - . Crew: Stankevicius, Volk. Nation: Russia. Related Persons: Stankevicius, Volk. Program: Buran. Class: Manned. Type: Manned spaceplane. Spacecraft Bus: Buran. Spacecraft: Buran Analogue. Maximum speed 530 kph. Maximum altitude 4000 m. Time 22 minutes..
1986 December 10 - . Launch Site: Baikonur. Launch Complex: Baikonur Jubilee. Buran Analog BST-02 flight 7 - . Crew: Stankevicius, Volk. Nation: Russia. Related Persons: Stankevicius, Volk. Program: Buran. Class: Manned. Type: Manned spaceplane. Spacecraft Bus: Buran. Spacecraft: Buran Analogue. First automatic landing from 4000 m altitude. Time 24 minutes..
1986 December 23 - . Launch Site: Baikonur. Launch Complex: Baikonur Jubilee. Buran Analog BST-02 flight 8 - . Crew: Stankevicius, Volk. Nation: Russia. Related Persons: Stankevicius, Volk. Program: Buran. Class: Manned. Type: Manned spaceplane. Spacecraft Bus: Buran. Spacecraft: Buran Analogue. Time 17 minutes..
1987 February 16 - . Launch Site: Baikonur. Launch Complex: Baikonur Jubilee. Buran Analog BST-02 flight 10 - . Crew: Stankevicius, Volk. Nation: Russia. Related Persons: Stankevicius, Volk. Program: Buran. Class: Manned. Type: Manned spaceplane. Spacecraft Bus: Buran. Spacecraft: Buran Analogue. Time 28 minutes..
1987 February 25 - . Launch Site: Baikonur. Launch Complex: Baikonur Jubilee. Buran Analog BST-02 flight 11 - . Crew: Stankevicius, Volk. Nation: Russia. Related Persons: Stankevicius, Volk. Program: Buran. Class: Manned. Type: Manned spaceplane. Spacecraft Bus: Buran. Spacecraft: Buran Analogue. Time 19 minutes..
1987 June 25 - . Launch Site: Baikonur. Launch Complex: Baikonur Jubilee. Buran Analog BST-02 flight 13 - . Crew: Stankevicius, Volk. Nation: Russia. Related Persons: Stankevicius, Volk. Program: Buran. Class: Manned. Type: Manned spaceplane. Spacecraft Bus: Buran. Spacecraft: Buran Analogue. Time 19 minutes..
1987 October 5 - . Launch Site: Baikonur. Launch Complex: Baikonur Jubilee. Buran Analog BST-02 flight 14 - . Crew: Shchukin, Volk. Nation: Russia. Related Persons: Shchukin, Volk. Program: Buran. Class: Manned. Type: Manned spaceplane. Spacecraft Bus: Buran. Spacecraft: Buran Analogue. Automatic landing. Time 21 minutes..
1988 January 16 - . Launch Site: Baikonur. Launch Complex: Baikonur Jubilee. Buran Analog BST-02 flight 16 - . Crew: Stankevicius, Volk. Nation: Russia. Related Persons: Stankevicius, Volk. Program: Buran. Class: Manned. Type: Manned spaceplane. Spacecraft Bus: Buran. Spacecraft: Buran Analogue. 1988 March 4 - . Launch Site: Baikonur. Launch Complex: Baikonur Jubilee. Buran Analog BST-02 flight 19 - . Crew: Stankevicius, Volk. Nation: Russia. Related Persons: Stankevicius, Volk. Program: Buran. Class: Manned. Type: Manned spaceplane. Spacecraft Bus: Buran. Spacecraft: Buran Analogue. Time 32 minutes..
1988 April 15 - . Launch Site: Baikonur. Launch Complex: Baikonur Jubilee. Buran Analog BST-02 flight 25 - . Crew: Stankevicius, Volk. Nation: Russia. Related Persons: Stankevicius, Volk. Program: Buran. Class: Manned. Type: Manned spaceplane. Spacecraft Bus: Buran. Spacecraft: Buran Analogue. Time 19 minutes. Final Buran Analog flight test. At the same time development of the auto-land system aboard the Tu-154 test bed is completed as well..
1994 Late or Early 1995 - . Buran 5 (cancelled) - . Crew: Tolboyev, Volk. Backup Crew: Sultanov, Zabolotski. Nation: Russia. Program: Mir. Flight: Buran 5. Spacecraft: Buran. Buran Flight 5 (3K1) would have been the first flight of the third orbiter. It would be the first manned Buran flight; the third orbiter was the first outfitted with life support systems and ejection seats. Two cosmonauts would deliver the 37KBI module to Mir, using the Buran manipulator arm to dock it to the station's Kristall module. Final crew selection had still not been made at the time the program was cancelled. 2017 January 3 - . Death of Igor Petrovich Volk. - . Related Persons: Volk. Ukrainian test pilot cosmonaut 1977-1996. 1 spaceflight, 11.8 days in space. Flew to orbit on Soyuz T-12 (1984)..